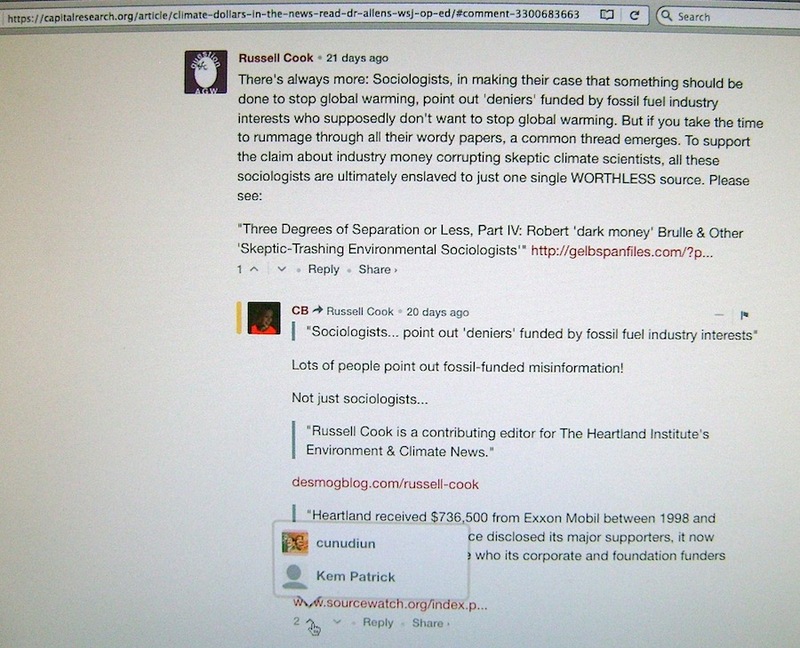 As noted in my prior post’s opening sentence, I have comment stalkers who land at online article/blog comment sections hurling personal attacks at me in response to whatever basic comment I’ve made on the global warming issue. 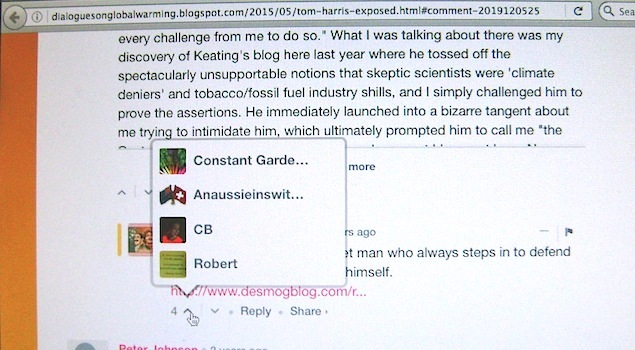 One in particular follows me around to specifically respond by placing a link to Desmogblog’s worthless profile of me. Now, allow me to first demonstrate it in the following funny way with a pair of visuals (click to enlarge). And when you mouse-over the upvotes for my stalker (I had to take an actual photograph of my computer screen to show that), who is one of the individuals seen there? “Cunudiun”, the comment stalker I featured in my blog post here. There was more context to what the “Dave James” commenter was saying, but the key point is that I wasn’t tossing out an unsupportable label. 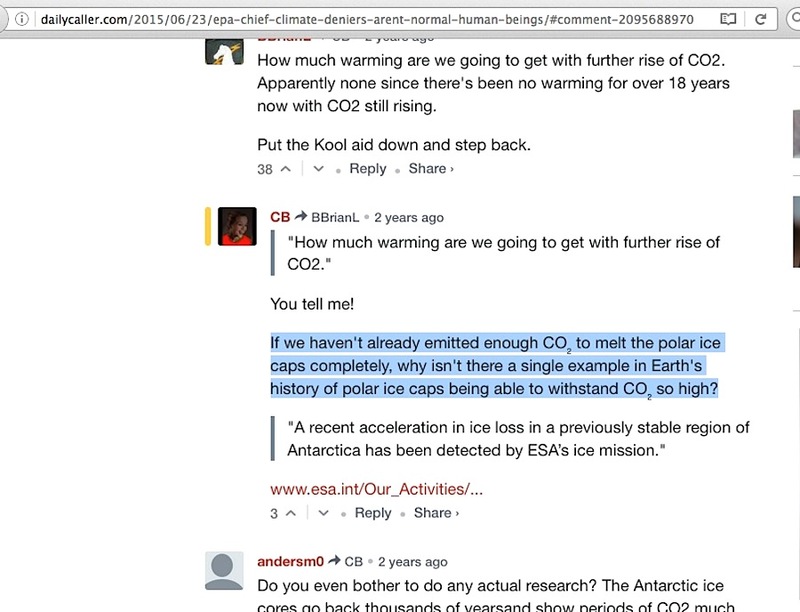 The “CB” commenter is a stalker of mine, and it is altogether too easy to find additional instances of this happening, as in this recent example, where I was again simply making an observation about the unsupportability of a commonly repeated global warming issue talking point. To “CB”’s credit there, he/she didn’t link to Desmog’s profile of me. Not so at this older example, where I – again – just made an observation, albeit via a directly quoted article headline straight from the Mother Jones organization. 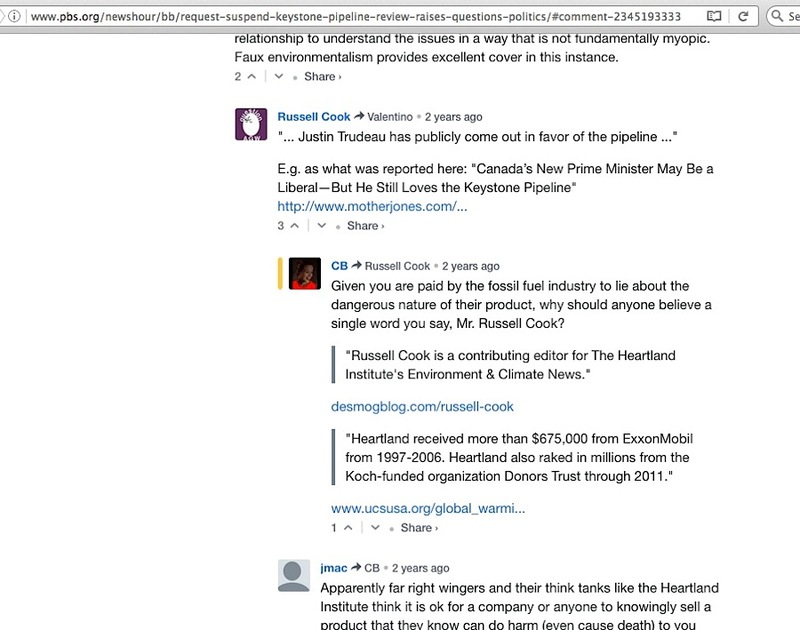 First, what caught my initial attention about this person was not his/her growing number of repetitions of linking to Desmog’s profile of me, but rather it was how I ran across more than one of his/her repeated questions, as in this example here, which I noted further down in the comments at that 2015 piece. 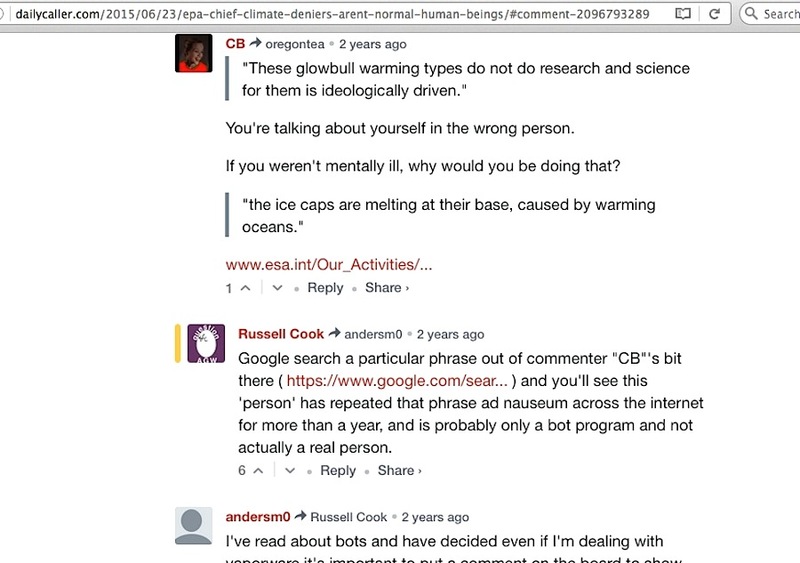 The Google search results showed a significant number of repetitions, which is why I wondered if the person was not actually a robot computer comment-generating program. The second elemental detail here is something I noticed only just very recently – in looking at this person’s commenting history (the quantity increases daily), as of this time of writing, he/she/it has 31,856 comments posted since joining the Disqus system on 8/2/2014. 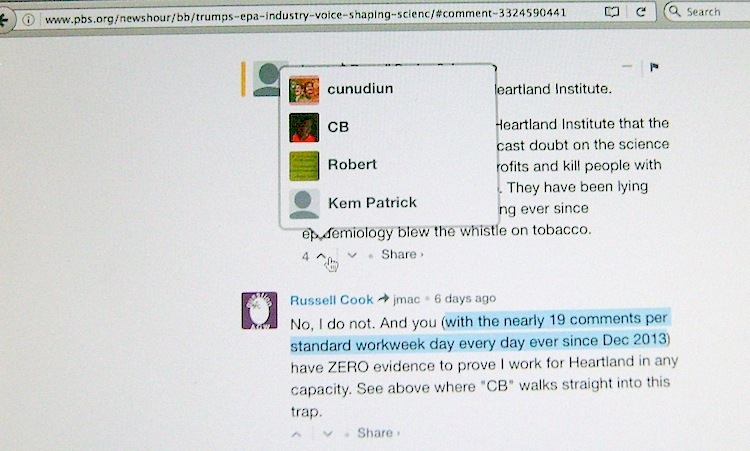 If you do the math via a business days counter of regular five days per workweek, that ends up to be 31,856 divided by 708 days, which equals a rounded up figure of 45 comments per day. Figure 8 hours per day, and that ends up being a bit over 5 and a half comments per hour, or one just short of every 11 minutes. 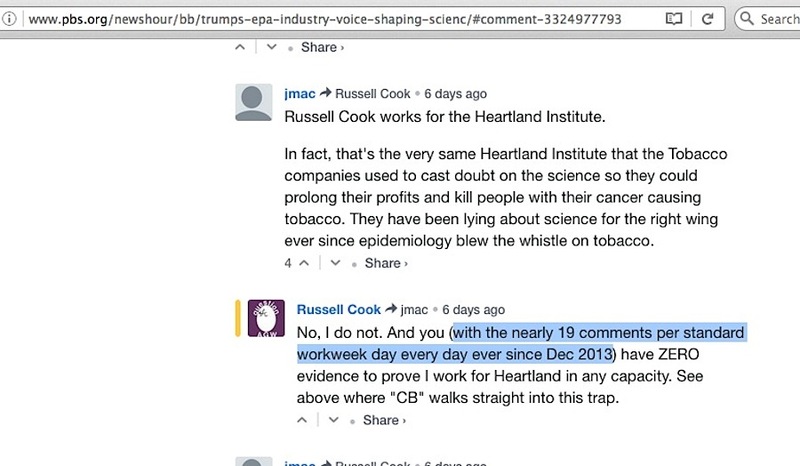 For comparison, do the same calculations for my commenting history to date, and you end up with a figure of around 1 and a half comments per day. We have one of two things here. 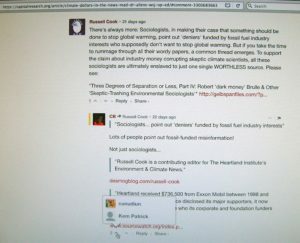 Professional commenters paid to toe the ‘man-caused global warming line’ or robot computer programs designed to throw off amateur critic commenters or to spread misinformation and lies about people like me. 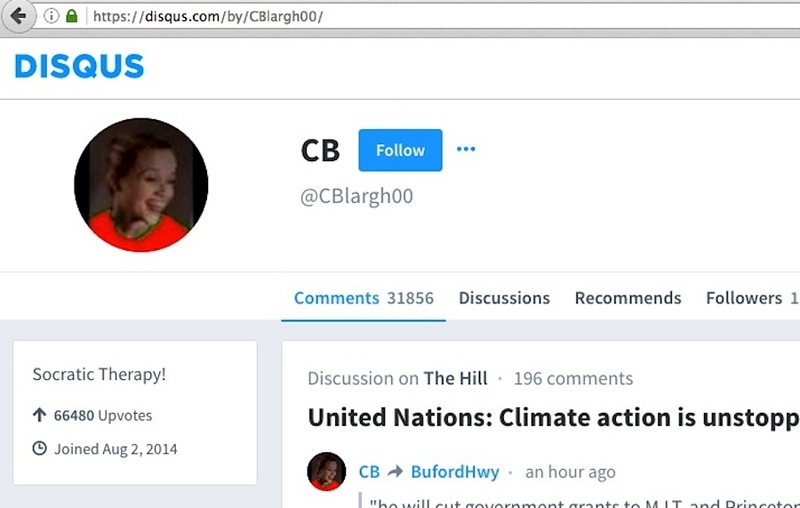 If the collective idea that the science supporting man-caused global warming is so solid, why would anybody even think up the idea of having either paid professional commenters or robot program commenters? 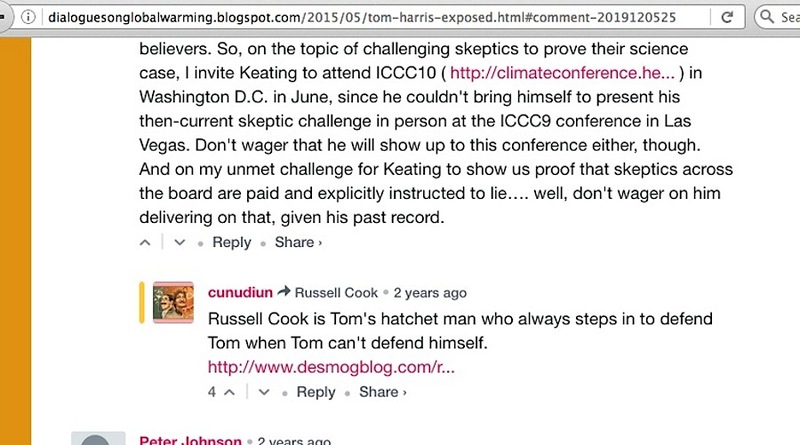 This entry was posted in Character assassination by Russell Cook. Bookmark the permalink.